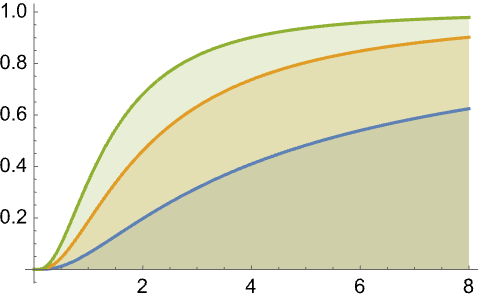 represents a beta prime distribution with shape parameters p and q.
represents a generalized beta prime distribution with scale parameter β.
represents a generalized beta distribution of the second kind with shape parameter α.
BetaPrimeDistribution[1,q,1,β] is also known as the Lomax distribution. 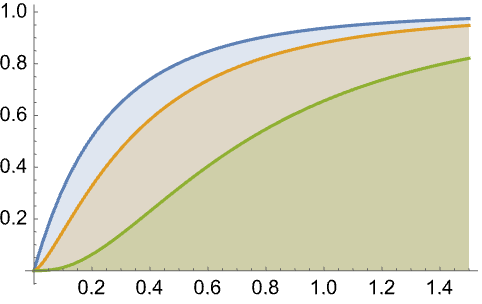 The probability density for value in a beta prime distribution is proportional to for . 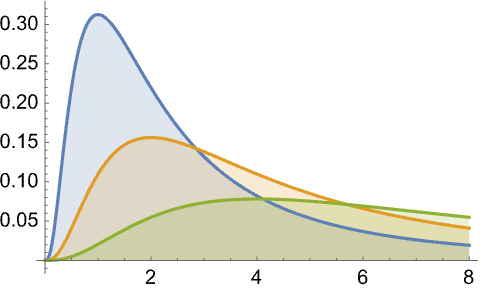 BetaPrimeDistribution allows p, q, α, and β to be any positive real numbers. BetaPrimeDistribution can be used with such functions as Mean, CDF, and RandomVariate. BetaPrimeDistribution[p,q,α,β] is sometimes referred to as the generalized beta distribution of the second kind, the inverted beta distribution, or the type VI Pearson distribution (PearsonDistribution). The two- and three-argument forms BetaPrimeDistribution[p,q] and BetaPrimeDistribution[p,q,β] evaluate to BetaPrimeDistribution[p,q,1,1] and BetaPrimeDistribution[p,q,1,β], respectively, and are sometimes referred to as the standard beta prime distribution and the generalized beta prime distribution, respectively. 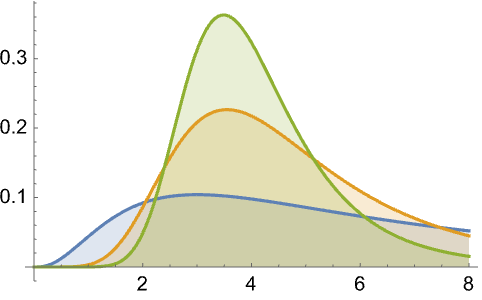 In Bayesian analysis, the beta prime distribution arises as a prior distribution for binomial proportions expressed as odds. 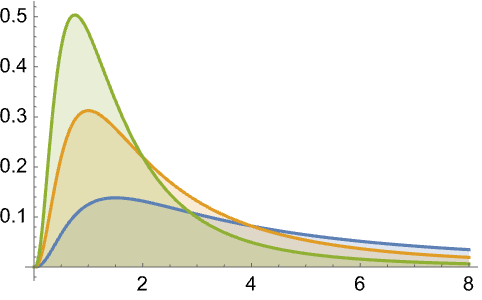 The beta prime distribution has also been found to model many real-world phenomena. 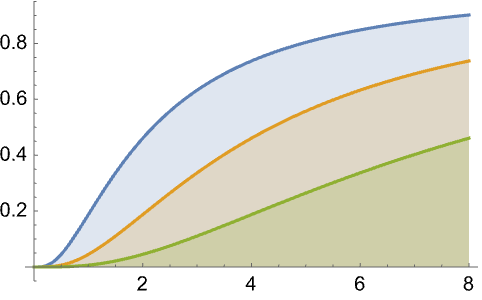 For example, the beta prime distribution has proven useful in empirically estimating security returns and in the development of option pricing models. More recently, it has been applied to the modeling of insurance loss processes. Elsewhere, the long tail of the beta prime distribution has been shown to make the distribution particularly well suited to modeling the frequency of behaviors likely to transmit diseases among individuals versus the actual transmission of such diseases. RandomVariate can be used to give one or more machine- or arbitrary-precision (the latter via the WorkingPrecision option) pseudorandom variates from a beta prime distribution. Distributed[x,BetaPrimeDistribution[p,q,α,β]], written more concisely as xBetaPrimeDistribution[p,q,α,β], can be used to assert that a random variable x is distributed according to a beta prime distribution. Such an assertion can then be used in functions such as Probability, NProbability, Expectation, and NExpectation. 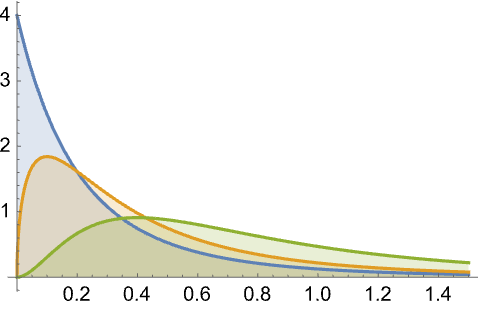 The probability density and cumulative distribution functions may be given using PDF[BetaPrimeDistribution[p,q,α,β],x] and CDF[BetaPrimeDistribution[p,q,α,β],x]. The mean, median, variance, raw moments, and central moments may be computed using Mean, Median, Variance, Moment, and CentralMoment, respectively. DistributionFitTest can be used to test if a given dataset is consistent with a beta prime distribution, EstimatedDistribution to estimate a beta prime parametric distribution from given data, and FindDistributionParameters to fit data to a beta prime distribution. ProbabilityPlot can be used to generate a plot of the CDF of given data against the CDF of a symbolic beta prime distribution and QuantilePlot to generate a plot of the quantiles of given data against the quantiles of a symbolic beta prime distribution. TransformedDistribution can be used to represent a transformed beta prime distribution, CensoredDistribution to represent the distribution of values censored between upper and lower values, and TruncatedDistribution to represent the distribution of values truncated between upper and lower values. CopulaDistribution can be used to build higher-dimensional distributions that contain a beta prime distribution, and ProductDistribution can be used to compute a joint distribution with independent component distributions involving beta prime distributions. BetaPrimeDistribution is related to a number of other distributions. 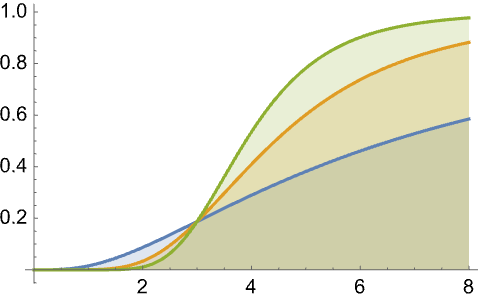 For example, BetaPrimeDistribution[p,q,a,b] simplifies to DagumDistribution[p,a,b] when , to SinghMaddalaDistribution[q,a,b] when , and to LogLogisticDistribution[a,b] when both and . In addition, the two-parameter form BetaPrimeDistribution[p,q] has the same PDF as the type VI Pearson distribution PearsonDistribution[6,1,f/g,1/g,1/g,0] where and and is related to both type II and type IV versions of ParetoDistribution.The PDF of BetaPrimeDistribution is a transformation of that of BetaDistribution, while the four-parameter version BetaPrimeDistribution[p,q,a,1] is the quotient of two independent random variables XGammaDistribution[p,1,a,0] and YGammaDistribution[q,1,a,0]. BetaPrimeDistribution is also related to FRatioDistribution, DirichletDistribution, KumaraswamyDistribution, NoncentralBetaDistribution, and PERTDistribution.